Will suit most Lineal Vibration Machines on the market. The International Vibration Training Regulating Body Lineal Safety Program was especially designed to introduce Lineal Vibration Training to the population in the safest and most effective manner possible. The perfect blend of physics and physiology. The program done frequently enough will not only give great ongoing results but is easy to learn and become confident at, which is why each pose and instruction should be done in the exact order given (unless instructed otherwise due to injury). Please use both the poster and instructions to get the positions precise. And remember all positions are held for the entire duration of the pose. Start with your feet hip width apart, perfectly straight, with heels near the back edge of the machine. Drop down to a deep half squat (like sitting down in a chair) keeping your legs perfectly parallel to each other (knees do not come together). Pivot forward at the waist so you keep balanced at all times. (Do not swing on the handle bars, they are there for balance only - No �water skiing�). Keep feet perfectly flat for the duration of the pose, which means pressure through your heels and toes must be even. Hold pose for required time. Note: The last 10 seconds is just as important as the first 10 seconds. A good quality machine should slowly get harder as the time progresses with the last few seconds being hard work. This is normal. If any immediate pain is felt, STOP, get off and tell your instructor. Place large mat on machine, small mat on the ground quite close to platform. Kneel in front of platform on the small mat. Place hands on outside edge of mat. Drop pelvis so a straight line is made between knees and shoulders. When machines starts drop body halfway towards plate. As per photo, make sure hands are in line with chest, not shoulders. Look down towards knees (very important) as looking up even for a second can cause stress to neck area. Hold pose and relax for duration of exercise. Place large mat on machine, small mat close to machine on floor. Kneel in front of the machine, placing hands up on the flat outside edge of the mat on machine. Lift you body up onto its toes (back straight and arms still straight) Shift your body weight right up over the top of your hands/chest. Looking down towards your toes, bend your arms clearly out to the side and drop halfway down toward the machine (keep a clear line of sight of your toes for the full duration of the pose). Keep your head down, and keep your weight centered over your chest. Hold onto handle bars. Place the ends of your big toes on outside corners of the platform (feet at a 45 degree angle). Drop down into a classic wide stance squat position. Keep your knees out over, and in line with your feet. Again drop down almost as though you were about to sit down, then come up a few inches. Important Note: moving your knees inwards as you fatigue is something to watch for in this pose. Place large foam mat on plate. Sit on foam mat facing out from the machine. Put hands on mat tight next to hips with fingers curled over front edge of machine. Make sure palms of hands stay flat and are on properly (not half hanging off). Hands do not move after this. Bend arms out to the side in an exaggerated way and drop down the front edge of the machine. 90% of the weight should be through the palms of your hands, 10% on your tailbone touching the carpet (not sitting on the foam). Look at knee area to keep neck muscles relaxed. Keep lower back slightly touching unit at all times. 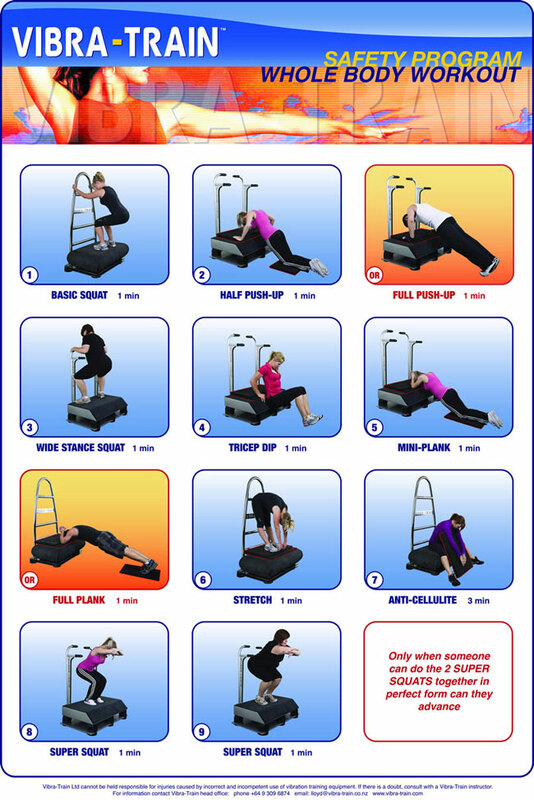 Place large foam mat on the machine. Kneel in front of machine. Stretch out and place elbows on mat in approx the center of the machine, just slightly closer together than your shoulder blades. Place hands tightly together. Look down towards your knee area then drop your pelvis towards the ground enough so your back is straight. Hold pose and relax. DO NOT contract stomach area. Breath through nose if this helps you relax. Kneel in front of machine on the floor. Look down towards your knee area then lift your knees off the ground, up on your toes, locking your legs. Drive your heels back so you are outstretched. Keep hands locked, keep head down and keep heels back. Place large foam mat on machine in approx the center of the plate. Stand on mat. Feet hip width apart, perfectly straight. Lean back against handle bar. Bend forward from waist and relax. Just dangle arms, do not try to stretch. Legs may be locked or unlocked depending on personal comfort level. Sit on machine holding onto the large mat. Move back until the back of your knees are in line with the front edge of the machine. Widen your legs and place the large mat between them, leaning forward over the mat. Stand with your feet hip width apart, feet perfectly straight, with toes near the front edge of the machine. Keep low, keep balanced and keep feet flat the entire duration of the pose. Remember: use both the poster and instructions to get the positions precise. All positions are held for the entire duration of the pose. Vibra Train Ltd can not be held responsible for injuries caused by incorrect and incompetent use of vibration training equipment. If there is any doubt, consult with a Vibra Train trainer.